It’s the first week of the month, and what does that mean? Android OS distribution numbers are released for all of the “fragmentation” arguers to have a field day with! This month we get to see the debut of Jelly Bean (Android 4.1) on the chart at 0.8%, something that I’m sure Apple will use in a big bold slide during their iPhone 5 announcement. Then again, their adoption rate is always flawed since they update their devices and hack out all of the newly announced features that apparently can’t run on older hardware, but I digress. So what do we have here? Ice Cream Sandwich is up to 15.9%, a solid 5% jump in a month’s time. You can probably attribute the increase to devices like the DROID RAZR and XOOM receiving the update over the last month. Now that the Rezound, EVO 3D, and others are in the process of receiving it as well, that number will only jump even higher over the next few weeks. Numbers for Froyo and Gingerbread are all decreasing. 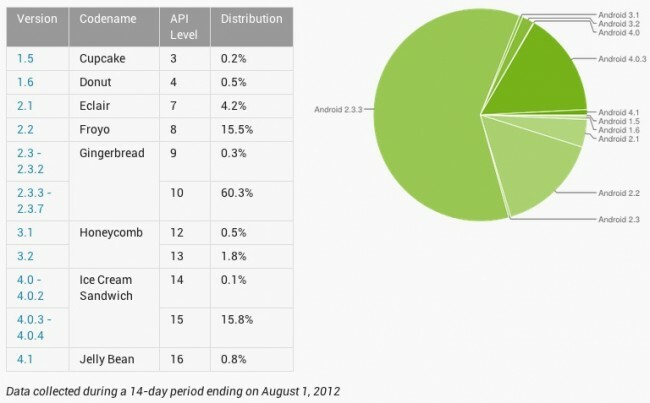 There you have it, the August 2012 Android OS distribution numbers. Which percentage are you included in?